The ideal addition to our stamping parts are our precision tools, stamping parts produced from this and the resulting modules. From the construction and manufacturing of tools to the series production of stamping tools and modules, we offer you individual solutions. The combination of our precision stamping tools, produced ourselves, with the constructive dialogue between you and your competent employees ensures an innovative solution and the basis for your economic success. Our in-house tool and die shop enables us to start metal stamping parts as soon as your design is approved. We have the capabilities to robotically transfer parts from die to die in the stamping process, for fast, efficient production. We also utilize progressive dies and hand fed line dies to produce precision metal stamping parts. These capabilities allow us to provide exceptional precision and part-to-part repeatability. Our engineering and tech group will work with you as needed to refine your designs and develop a final product that will meet or exceed your expectations. Vision can produce metal stamping parts and components from a range of materials and alloys, including carbon steel, stainless steel, aluminum, and others. We work in thicknesses up to 20 mm. 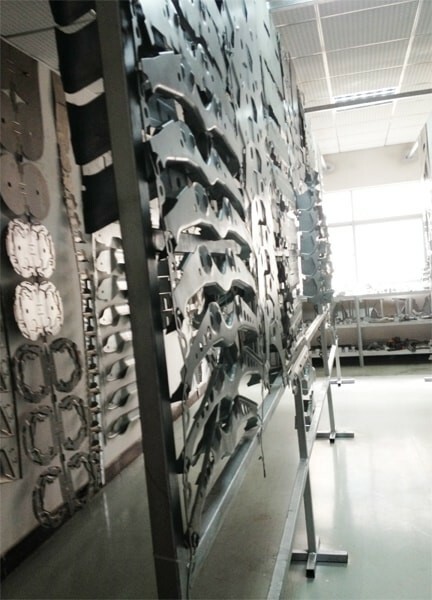 Vision Products has specialized in metal stamping parts of all sizes since 1946. We can produce small parts requiring as little as 100 tons of force, or, with press capacities up to 1,700 tons, we can create massive parts up to 72” x 180”. No matter how large or small the metal stamping parts you need are, Vision will deliver them with exceptional precision and in turnaround times to meet your deadlines.